The word ‘Holwood,’ also known variously as ‘Hollwood,’ originates from the Anglo-Saxon terms ‘Holt Wudu,’ meaning a wood or forest (Gammon, 1934: 13). Holwood is located in the small village of Keston, near Hayes, in Kent. In the autumn of 1785, William Pitt purchased Holwood House from Mr. Randall, a London shipbuilder, and from that time until he was forced to sell it in 1802 to pay off some debts, Holwood was Pitt’s favourite country retreat (Gammon, 1934: 24). Pitt’s great passion at Holwood was cutting and planting in order to create striking views from his residence to the vale of Keston. Amongst Pitt’s alterations, in July 1790 he diverted the course of the Westerham Road and enlarged and enclosed the estate by an additional thirty acres; this was permitted by Keston parish on the condition that Pitt pay a perpetual annuity of £10 for the poor (Gammon, 1934: 24). 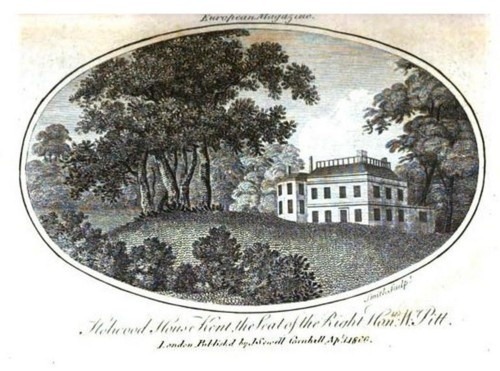 Below are several engravings of Holwood House as it appeared during Pitt’s time. "At that period I was a boy, and often rode over with my father from Freelands, where we lived, and while he was closeted with the Minister I was left to wait in the dining-room, which I had full time to explore. The furniture was of the most simple description; I remember a chaise longue was drawn near the fireplace, on which he [Pitt] might be supposed to have thrown himself on his arrival from town, when jaded by a long and stormy debate in the House; a few books lay on a hanging shelf within reach, amongst which I recollect a pocket Virgil, marked and dogs-eared in every part of the Aeneid" (Raikes, 1857: 119-120). What an evocative description! 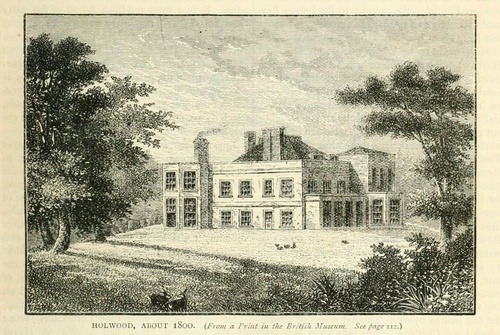 The print below represents Holwood as it was in about 1800. Of interest, Gammon (1934: 26) notes that “the walls of one room [at Holwood] are said to have been covered with Gillray’s and other political caricatures levelled at himself [Pitt], which seemed to afford him much amusement. He [Pitt] used to show them to his friends, and laugh heartily when a particularly good hit at himself was made.” Pitt always did possess a playful sense of humour. Ehrman (1969: 591-2) describes Holwood thus: “…the drawing room had green cotton curtains and green and white striped covers to the sofa and chairs, the dining room green curtains and a green and pink Wilton carpet, the study green curtains again, while Pitt’s bedroom had white curtains and white coverings to the four-poster bed. The furniture in the larger rooms was mahogany almost throughout. There were five more bedrooms in the back quarters and the garret, and the offices included a still-room, dairy, and laundry. There were also a coachman’s room, and a groom’s room with two beds, over the stables.” Also see the Holwood Inventory of 4 July 1794 at PRO 30/8/219 for a more comprehensive source. Unfortunately, Pitt’s Holwood is no more, having been demolished to make way for Decimus Burton’s Holwood in the 1820s. Indeed, the present house does not stand at the same site as Pitt’s Holwood (Gammon, 1934: 51). Fortunately, the remains of the ‘Wilberforce Oak’ (the spot where, after a conversation with Pitt below the old tree, Wilberforce decided to give notice of his intention to pursue the abolition of the slave trade) and a stone bench Earl Stanhope erected in the 1860s to remember that ground-breaking conversation, can still be seen by visitiors strolling through the grounds which are accessible to the public. Ehrman, J. (1969) The Younger Pitt: The years of acclaim. London: Constable, pp. 591-2. Gammon, F.S. (1934) The Story of Keston in Kent. London: Thomas Murby & Co., pp. 13, 24-26, 51. The National Archives, Kew. PRO 30/8/219 - Holwood Inventory of 4 July 1794. Raikes, T. (1857) A portion of the Journal kept by Thomas Raikes, Esq., from 1831 to 1847, Vol. 3. London: Longman, Brown, Green, Longmans & Roberts, pp. 119-120.